The Met Gala. It's avant-garde, extravagant fashion, the country's entertainment elite and jaw-dropping decor. Who could possibly say no? 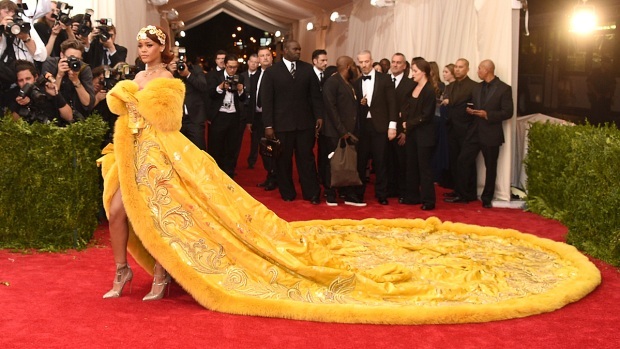 Well, according to a few celebrities, the Met Gala isn't all roses. Tina Fey and Gwyneth Paltrow are just a few that have publicly criticized the Metropolitan Museum of Art's Costume Institute's famous ball. Is all of the glamour just a facade? According to 2016 attendee Demi Lovato's Instagram, the gala may not be a place that welcomes her "awkward" nature. In the posted photo, it looks like the singer is uncomfortably standing alone as Nicki Minaj appears to be giving her side-eye. The famous steps are a place for perfection, and...well...the singer had some trouble getting comfortable, telling her followers that it would be her first and last time she was attending. But, she isn't the only one that felt out of place. Previous attendee Amy Schumer expressed to SiriusXM radio host Howard Stern that the costume-like fashion was not her style: "We're dressed up like f------- a-------." Although the comedian enjoys a good costume party, this one was clearly missing the "fun" she was hoping for. It was "punishment," she said. "I got to meet Beyoncé, and she was like, 'Is this your first Met Gala' and I was like, 'It's my last.'" Tina Fey's experience didn't seem to differ much from Schumer's. On the "Late Show With David Letterman," she, too, shared musings on the nature of the event. "It is such a jerk parade...if you had a million arms and all the people you would punch in the whole world, they were all there," she joked. From walking through a hallway of gorgeous boys that stood as decoration, dealing with mean yet successful people, sitting next to a CEO on ecstasy, the actress and her husband were over it. If there's anyone that seems to fit the mold of the typical Met Gala invite list, it's Gwyneth Paltrow. She's a Hollywood A-lister, after all. She's a red carpet veteran with established relationships with the world's biggest designers, makeup artists and hairstylists. But, the Goop owner was not impressed by the antics. "I'm never going again. It was so un-fun. It was boiling. It was too crowded. I did not enjoy it at all," she told USA Today. Then, there's Lena Dunham, an actress who has built a reputation around being unapologetically herself. Yet, she found herself publicly apologizing in 2016 for her insecurities after sharing in her Lenny Letter that she felt that Odell Beckham, Jr., who sat with her at the event, thought, "That's a marshmallow. That's a child. That's a dog," when he saw her in a tuxedo. It was her own feelings of being lesser than that propelled her anxiety: "It was like a countdown to when we could escape."